I've been paying attention to what is said between Oneness adherents and trinitarians for years, on this forum and elsewhere. I think a cordial and irenic debate might provide a suitable means to move the needle a bit on this discussion. If there is anyone willing, let's talk about how we could put together something, either in written or live form. I've had some success, by dialogue on YouTube where both parties agree a title and then discuss that by posting alternate short videos, of an agreed number and length into our channels, but also into a common playlist. The key is the title to be discussed, we agree a title and don't deviate from that. Thus far I have deliberately avoided any discussion with the word Trinity or Oneness in it, as sadly, it is my opinion that these topics cannot be discussed, for definitions are simply ignored by one or both parties, thus it's preferable to discuss a simple small topic such as ..... is the Son of God the creator yes or no? ..... or is the Son of God also God the Father? .... or Is the Son of God eternal or created? Even though I gave up on church and religion years ago, I've found that no matter how often I say that I reject the concept that God is three separate persons, or three separate spirits or three brings etc, Oneness Apostolics simply repeat these claims about me over and over again that as I am a Trinitarian, therefore I must believe in three separate persons, who are three separate spirits and three beings. When I tell them that I left the church because of the Trinity, as most baptists and Pentecostals in my part of the UK cannot accurately define the Trinity according to the ancient creeds, I've lost count of the number of times that the Trinity has been defined to me as Jesus is the Father. The only solution is to avoid labels and jargon, and get back to discussing one single point of doctrine. If any Apostolic or whatever is interested in dialogue with me, my YouTube channel has 10 million hits and is a religious channel. thanks. ps: According the creeds the three persons are distinct, not separate? I agree, in any debate/discussion with a Oneness Pentecostal, for their to be any hope (still no guarantee) that you will be able to even communicate the topic must be very, very specific and avoid terms that cover a great deal of information. With regard to your question, yes, the Creeds are very specific that the three persons are one substance/being, and that substance/being is not divided. Thank you for quoting this, my only problem with the creed (apart from the out of date language the meaning of which is often somewhat different today from the 5th century Greek), is filioque, it's not very clear, but I'd possibly agree with the Orthodox, a single procession but THROUGH the Son (as opposed to a second procession), possibly Augustine Greek was a little flaky? This was one of those arguments that just should never have resulted in a split, or in this case a "schism." At any rate, the entire matter was seen as more of an excuse for Constantinople to try to legally separate from Rome since I believe this was more a matter of it being inserted into the creed as this was not new doctrine or dogma in the church universal. And it had as far as I know always meant from the Father through the Son, it was the Greeks who at times had difficulty with the Latin. The concern in the West and what was really opposed was a teaching that the Holy Spirit proceeds from the Father alone which again I believe would always have been considered heretical in the church catholic. This is one of those times when I side with the West, and as I said, I think the Orthodox were using this filioque being inserted into the creed as an excuse for political ends, not doctrinal. It's great to see you posting mark. I continue to pray for you and I hope and pray you and yours have a blessed Christmas. Good to hear from you! My first thought about the entire debate about who the Holy Spirit proceeds from goes back to the old saying "the blind leading the blind". The whole debate wouldn't have even occurred had Rome and Constantinople stayed with the Biblical view that was clear spoken by the Lord Jesus "God is Spirit". You don't hear too many Trinitarians teach the Lord's words because it knocks the legs out of Trinitarian doctrine. Biblically, to have received the Spirit is to have Christ in you the hope of glory. Jesus did make it clear that he would abide in the believer and this was because of the infilling of the Holy Spirit. The concept of a third person literally proceeding from a 1st or 2nd person stationed at point A and going to a point B is not biblical. Anthropomorphic language is used to help us understand the infilling and work of the Spirit, but it all must harmonize with the Biblical fact that God is Spirit (John 4) and God is everywhere present already (Psalm 139). The Trinitarian has no good explanation about the simple, yet plain words of Jesus, "God is Spirit", because they lack the conceptual and terminology toolkit to deal with it. No way to harmonize exactly why the Holy Spirit is called the Holy Spirit, yet the Father is Holy and is Spirit and furthermore the Lord Jesus is that Spirit! To the Trinitarian the Holy Spirit is something like a proper name similar to "Bob" rather than a precise description of God's basic moral (Holiness) and non-moral nature (Spirit). The Holy Spirit is relegated to a dove, church is reduced to empty ritual. The Trinity was conceived by a dying church where the Holy Spirit was not allowed to move. 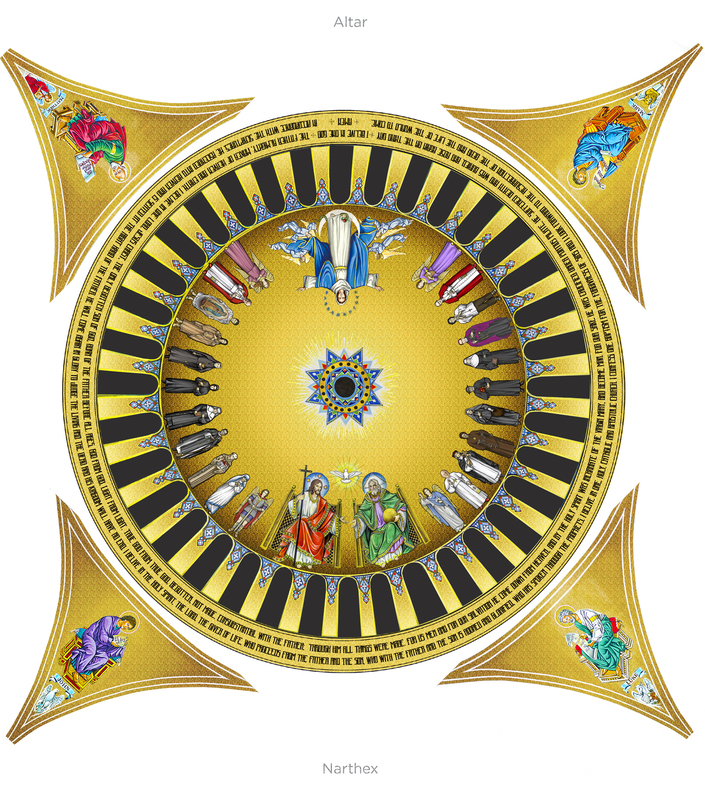 From the Trinity Dome, Trinitarian polytheism in flaming and blazing colors illustrates well the Trinitarian concept of three bodies forming the Trinity while spatially constrained. It's very sad that so many people get this concept of God and Trinitarians even on the protestant side rarely speak against full blown polytheism as shown here. Last edited by Neal; 12-18-17, 02:09 PM. Thank you so much for the kind words and the Christmas blessing James, it truly means a great deal. I just finished another 6 month CT scan and met with the doctor last week, and my miracle continues as they still find no evidence or recurrence. I cannot tell you what a miracle this is but IT IS and it is the result of prayer! Thank you again very much. And you and yours be very Blessed this Christmas as we celebrate the entrance of our Lord, the Son of God, into our world to save us! Neal, I'm not really interested in hyperbole, mischaracterization, or other forms of snobbery. What I am interested in is a sober and reasonable debate, and that with equal time and a focused thesis. If that isn't you, then I completely understand. Moreover, I'd prefer someone who has some skin in the game (i.e., someone who has some form of education, formal or informal, and is a member or minister of a Oneness church). Ok Michael. I propose that we keep the format simple for now. Sound good, or do you have something else in mind? "The Son of God was in relationship with his Father as a divine person before his birth in Bethlehem." I'll go for a written debate with your thesis. Let me know how you want to proceed. Thank you for this wise comment, I did not realise this. Would you also consider a video debate with me, we post alternate videos on the same title via our YouTube channels? This is not a format for "a debate," this is a format for having two concurrent debates, and it's exactly what is wrong with most of the debates you see online (and with the rules, or at least the explanation and understanding of them). When you state #1 and #2 as you did above, it basically has two affirmative arguments going on and then trying to rebut the others affirmative argument...that's a mess. A proper debate that has some hope of being educational to others should have a thesis/resolution stated as the affirmative and the other person/team will take the negative...so #2 above should necessarily be a rebuttal. The person/team with the affirmative must present evidence and affirmative arguments, the person/team taking the negative must find weaknesses in the evidence and/or arguments and present a counter argument to the evidence and arguments that have been proffered. Using the proposed thesis as an example, if the affirmative uses Phil. 2:5-8 as part or all of their evidence and presents an argument(s) based on that evidence/text, you must provide a counterargument based on that text. That might be by finding a fatal flaw in the exegesis of the affirmative and/or by presenting an alternative interpretation based on exegesis of the passage. But if a debate were graded, the affirmative argument would be graded as would the counterargument (which must directly address the argument presented). Here is a debate grading rubric and I for one wish that people would keep in mind how to properly score a debate when creating/explaining rules for one. If debates were actually graded in this manner I think the debates would be of much better quality and much more education for others.